Arctic Waters was a workshop on nature, research and art, directed by an artist and a scientist. 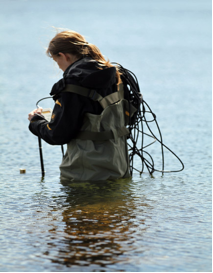 From a scientific perspective it investigated Subarctic water ecosystems, especially phytoplankton and zooplankton. The key questions were: “Why is this research done?”, and “In what way is monitoring of specifically arctic freshwaters done?” From an artistic perspective the workshop was thought of as an introduction to artistically motivated field work in the mountains and laboratory.